The Steelers won their second straight game and it was an important one against the Bengals! It took a full 60 minutes. It took contributions all around. And it took some heroics. 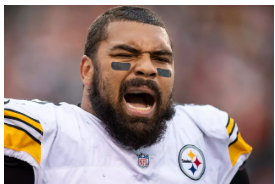 And in the end, it all came together as the Steelers pulled out a 28-21 win over the Cincinnati Bengals at Paul Brown Stadium in an AFC North battle. The win sends the Steelers into their bye week with a 3-2-1 record. Ben Roethlisberger did what he does best, taking the Steelers on a last-minute drive to win the game. Taking over at their own 23-yard line with 1:12 to go, and down, 21-20, Roethlisberger first hit JuJu Smith-Schuster for eight yards. He went back to Smith-Schuster for 10 yards, and then connected with him over the middle for 23 yards. With just 15 seconds to play, Roethlisberger went deep to Brown, who pulled it in and never slowed down, aided by a block by Justin Hunter and taking it in for a 31-yard game-winning touchdown. The Steelers added a two-point conversion, when Roethlisberger hit Smith-Schuster, for the 28-21 win. 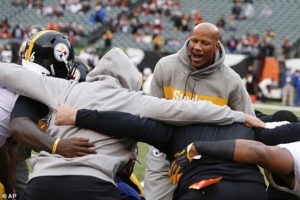 The win was huge, but seeing Ryan Shazier walk across the same field a year later was even bigger! For whatever reason, the Bengals just seem to give up on the run against the Steelers. Joe Mixon had 64 yards on just 11 carries, including a 4-yard touchdown, but the Bengals had just 13 rush attempts. Six of those came in the first half. Stephon Tuitt had his first sack of the season, a tackle for a loss and two QB hits in his best performance of the season. Javon Hargrave had one of the other sacks. (Gerry Dulac, Pittsburgh Post Gazette).